UK anglers Keiron and Julia decided to spend the second day of their Thailand angling holiday predator fishing at IT Lake monsters predator fishing lake. On arrival at the predator lake the anglers began lure fishing and were immediately amongst the predators catching Alligator Gar and Pacu from the off. Further casts with the lures resulted in more Alligator Gar, Asian Redtail Catfish, Pacu and a bonus Barramundi in the space of little more than a few hours. With a change over to deadbait in the afternoon and already sixteen fish caught on the lure the days predator fishing looked very optimistic. Within minutes of changing over to deadbait the rods once again burst into life with simultaneous takes on both predator fishing rods happening on several occasions. 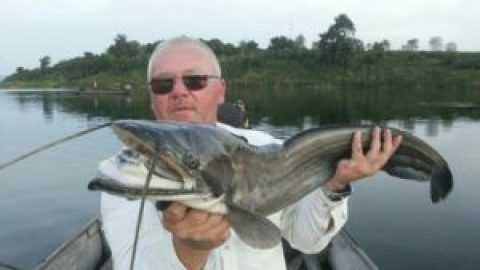 The couple continued to land Redtail Catfish after Redtail Catfish as the days predator fishing continued with weights ranging between 10-30kg’s. After a quiet spell which saw a decent sized Arapaima rolling over a spot further down the margin a dedabit was quickly dispatched to the area and was promptly picked up by said Arapaima. The Arapaima on feeling the hook hit home duly responded with a savage display iof head shaking and breaching the water before embarking on a series of heart stopping runs as it charged around in the centre of the lake. The Arapaima was visibly a decent size and continued to breach the surface and perform rolls in an effort to rid itself of the hook. The hook held firm and before long the exhausted Arapaima was carefully guide to the recovery cradle submerged in the margins of the lake. At over 1.5 metres in length with an incredible girth the Arapaima was clearly a large specimen. 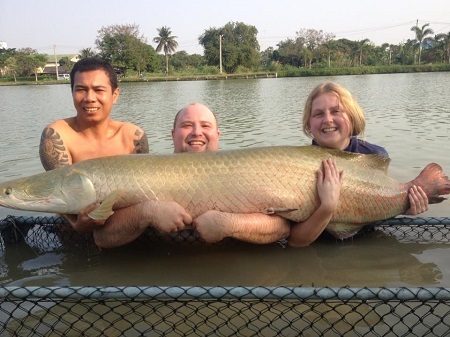 The Arapaima was allowed a period for recovery before being proudly displayed by the captors and carefully released back into the lake. The action did not finish there and the anglers accounted for a further Arapaima and a shed load of other predators before the days predator fishing had ended. At the end of the days predator fishing at IT Lake Monsters the anglers had succeeded in landing over fifty different fish with Redtail Catfish, Alligator Gar, Snakehead, Barramundi, Asian Redtail Catfish and several other monster fish species in addition to two beautiful Arapaima. 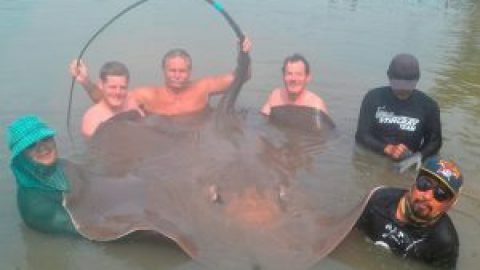 This is one of the best days Thailand angling that Fishsiam client has ever experienced at IT Lake Monsters and a truly worthy addition for our catch reports page. Well done Keiron and Julia!